Danish water engineer Monika Balicki came to Queensland as a young graduate for work experience. Discovering it was one of the best places in the world to study water modelling, she decided to stay and has now set up her own water engineering consultancy business. You can never have enough data. Denmark, for instance, has a long history of data when it comes to water modelling, but there’s room for more. It casts a scant light on Australia’s hydraulic data dearth – and means a Nordic engineer looking to build a career in Australia has more than a cultural leap of faith to make. Luckily, a lack of data can also inspire. Monika Balicki, now a director at Water Modelling Solutions (WMS) in Brisbane, was just another school kid in Copenhagen interested in maths, chemistry and physics. Driven by a sense of adventure and a curiosity for the latest in water modelling technology, she found herself on the other side of the world: in a work-study – and subsequently her first job – on the Gold Coast with Danish hydraulic research company DHI. Australia wasn’t just one of Balicki’s top travel destinations, it’s also recognised internationally as one of the premier places to study water resources and engineering technology. Its communities are in need of flood modelling, something in which Balicki had no experience. Back home in Denmark, the majority of the drinking water supply comes from groundwater, which is extensively mapped, researched and taught at the Technical University of Denmark’s environmental engineering program. Her first year at DHI, everything around Balicki had changed: the climate, people and work. In the first year, she questioned whether she had made the right decision to come here. For a long time, engineers working with surface water modelling, which is used for flood mapping, were reliant on 1D and 2D software running on central processing units (CPU). Although faster options existed, they were prohibitively expensive. Today flood studies have pushed into the realm of 2D modelling with graphics processing unit (GPU) technology, which has improved investigations by making in-depth studies more cost-effective. An example of a 3D terrain model. There is still value in CPU paths, where accuracy has always been sufficient. However, more powerful computers have an advantage. Modelling in 1D requires a lot of effort at the model building stage. Flood behaviour is rarely one-dimensional, and 1D modelling requires a good understanding of where the water is going to properly represent dominant geographic features and water storage. This makes 2D models somewhat easier to develop, as the floodplain dimensions – vertical and horizontal – are already represented in the topography. Modelling groundwater in Denmark, Balicki also studied 3D water modelling, which is less often used for flood modelling but useful when looking at water quality, such as salinity and contamination. Australia is one of the best places to see the advantages of GPU modelling, according to Balici. A prime example is her team’s work in Toowoomba in 2015 as part of an update to the region’s planning scheme, a massive project covering nearly 13,000 km² that includes the Condamine River floodplain in Queensland. The flood assessment covered a distance of nearly 350 km and a floodplain area of approximately 6800 km². The Toowoomba Regional Council saw a need to update their model to improve flood-mapping accuracy. The original study by SKM (now part of Jacobs) was conducted in 2014 prior to the wide-scale availability of light detection and ranging survey (LiDAR) information for the study area. Previous modelling was based on outdated manual surveys of the area’s floodplain and topographical features. The new LiDAR data, in addition to advances in GPU technology, made it possible to develop a comprehensive map of flood elevation surfaces, velocities and depths, as well as flood hazard and hydraulic categories for a full set of events. GPU 1D and 2D MIKE FLOOD flexible mesh modelling allowed Balicki’s team to adjust the resolution to be more detailed in areas of interest, such as towns and less so in other areas along the Condamine River. The WMS team created a model ranging in detail from 3 m² to 3600 m² in area, building on the work conducted by SKM in 2014. The model was then validated to the 1976 and summer 2010-11 floods. In the past few years, 1D and 2D GPU technology has changed the game, rising in popularity as computing capability leaps forward. The top machines have reduced the processing times of hydraulic modelling from 10-100 times compared with CPU processing. Improved speed means the same accuracy is achieved in a shorter timeframe, in turn making possible larger models and finer resolutions. The improvements mean a larger ensemble of simulations can be considered when assessing unpredictable flood events. For instance, speed makes a difference when a long record of historical data isn’t available. While many Australian communities have records less than 100 years old, they can now look to engineers to predict what a 1-in-2000-year event might look like based on probability. Outside the Bureau of Meteorology, flood models are increasingly used for flood forecasting. They provide councils and the public with advanced warning and identifying hazards in an emergency, such as where fast-flowing water will create the greatest risk to residents. Despite the limitations on a small business, such as the financial commitment to expensive top-of-the-line technology, Balicki’s WMS has been able to acquire and apply GPU processing to several floodplain management projects. The life of a water engineer always seems more difficult when snow is involved. Balicki sees 2D GPU modelling as something more councils will rely on in future. To follow that trend, and further her knowledge of modelling systems such as MIKE and TUFLOW, she joined WMS Managing Director Blake Boulton in April 2015, taking a 50 per cent stake in the company. Boulton was a former colleague of Balicki’s at DHI’s Gold Coast office in 2010. He established WMS in 2012 and, after obtaining licences for MIKE FLOOD and XP-RAFTS, he started contracting part-time to Toowoomba Regional Council, assisting with flood studies and mapping. By 2015, Balicki knew that Australia was home, a place she could add value to the community. But leaving DHI was another tough decision. “When you work for a big engineering consultancy like DHI, you have the opportunity to travel overseas and work on interesting projects,” Balicki explained. Balicki, like most engineers, enjoys the challenge of adapting quickly to a new set of circumstances. By keeping up with cutting-edge technology, she has mastered new software; in cases where the right tools didn’t exist, she scripted her own. 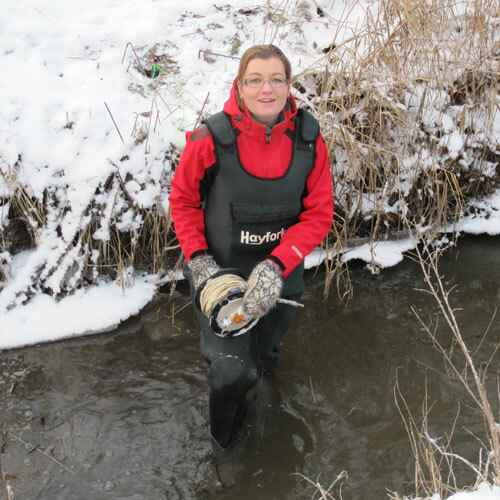 In the short time she’s been with WMS, she has led the development of GPU models for the Barwon, Gwydir, Mallowa and Gingham rivers in New South Wales, and the Condamine River in Queensland – the total area of which is larger than Denmark. “Why do people start businesses? Partly for the full ownership and knowing if you do something well you can pat yourself on the back,” she said. She survived a move to Australia without a support group, and it was a scary experience that turned into a great decision.